The stakeholder map is a technique commonly used for stakeholder analysis. Using the stakeholder map to guide conversations helps a team understand who the stakeholders for the project are, understand key characteristics about those stakeholders, and identify plans for engaging the stakeholders on an ongoing basis. Below is an example stakeholder map for a commission system replacement project described in Beyond Requirements. Note that the rest of the team (aside from the Arthur, nominally the Product Owner) did not put themselves on the map. 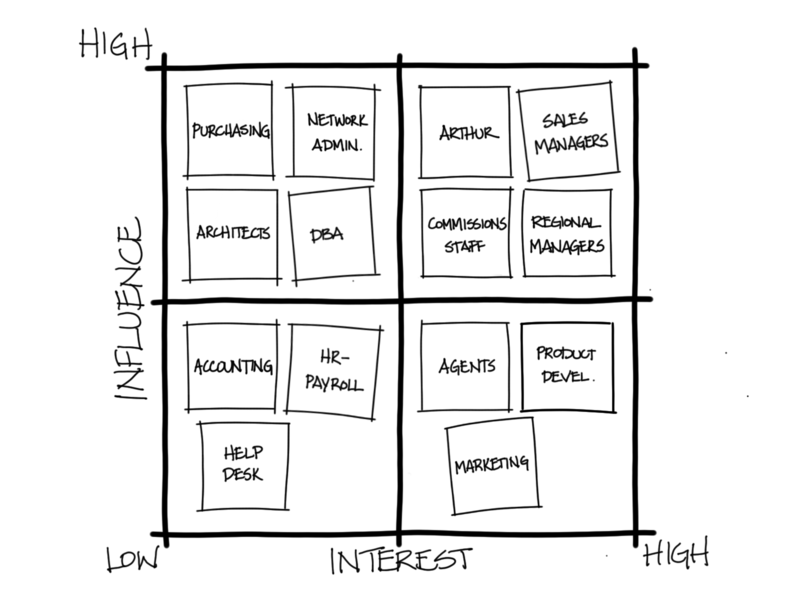 Had they done so, they would ideally all fit in the upper right quadrant—high influence, high interest. By explicitly discussing stakeholders using a stakeholder map, the team reduces the chance that they have forgotten someone who is impacted by or who can impact a project. The team also stands a better chance of having effective and efficient interactions with their stakeholders. 1) Generate a list of stakeholders. Gather the team together, provide them with sticky notes, and encourage them to think of as many stakeholders as they can. You may want to do some affinity grouping of the identified stakeholders before moving to the next step so you can remove duplicates and arrive at a manageable number of stakeholders. 2) Map the stakeholders based on their characteristics. There are a variety of different sets of characteristics that can be used to understand your stakeholders, but they typically represent some variation on the influence of the stakeholder (often referred to as their power) and the interest of the stakeholder. 3) Establish plans for engagement based on the characteristics. Each quadrant provides guidance on how to engage the stakeholders with those characteristics. 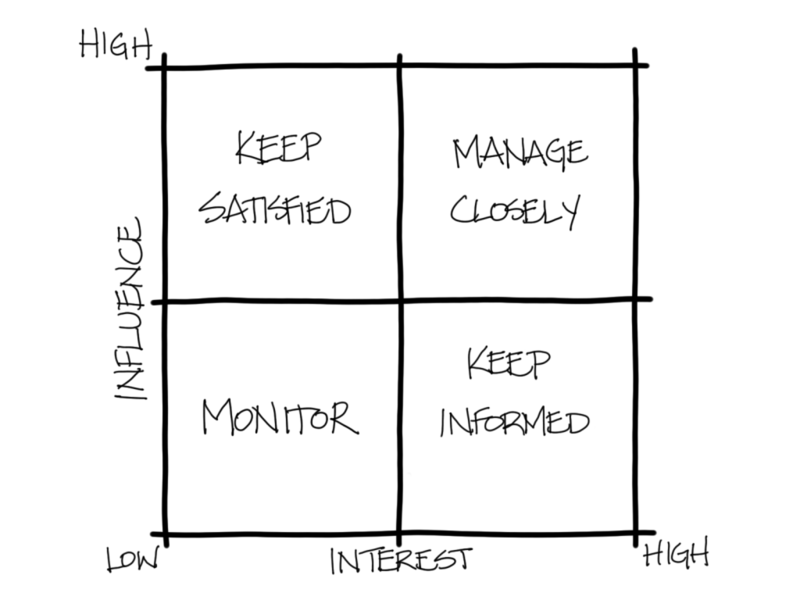 The team considers which quadrant the stakeholder was placed in and establishes the corresponding approach to engagement. These stakeholders are usually only partially impacted by the solution. An example from the commission system is accounting. General information is sufficient for these stakeholders, and it may be appropriate just to let them know where information is available and leave it up them to decide if they are going to take advantage of it. It can be helpful to keep an eye on these stakeholders to make sure that their interest or influence does not change throughout the course of the project. Stakeholders with these characteristics are a very good source of detailed information about your project, so it’s important to understand their needs and solicit their input. Stay aware of their perspective on the project; if they feel their concerns are not being addressed, they may engage more influential people. Some subject matter experts and end users are often in this quadrant. In the case of the commission system, agents fit into this category because they have a high interest in the commission system working properly (else they may not get paid), but their influence is limited because the main focus of the project is determining how the process runs. This group usually contains people with an important position in the organization who are not directly related to the project. In the commission system case, purchasing, the architects, the DBAs, and the network admins fall into this category because even though they are not directly involved with the project, they can exert a great deal of influence on it. Your team should engage with stakeholders in this group to understand and satisfy their needs when they are in alignment with the overall goal of the project. It also often pays to consult with these stakeholders on critical issues, but not on every single decision. You may also consider whether the project would benefit from having these stakeholders be more interested in the project. Teams should fully engage the stakeholders who fall into this category, which usually includes sponsors and highly influential subject matter experts. Whenever possible, these stakeholders should be explicitly part of the team. Discussions using a stakeholder map should definitely be held at the beginning of the effort, but it’s just as important to revisit the map on a regular basis, especially if there are changes in the business environment or project goals, or major new insights that could change stakeholders’ interest in a project. Any change in organization structure is also a good reason to revisit the analysis, because it may drive changes in stakeholder influence. Often, the best way to gauge stakeholder interest is to talk with them directly about their perspectives on the project. Determining their influence can be a little trickier, as individual stakeholders may have inflated perceptions of their own influence. Those discussions are best held within the core project team. Note: These two resources describe the same activity with two major differences. 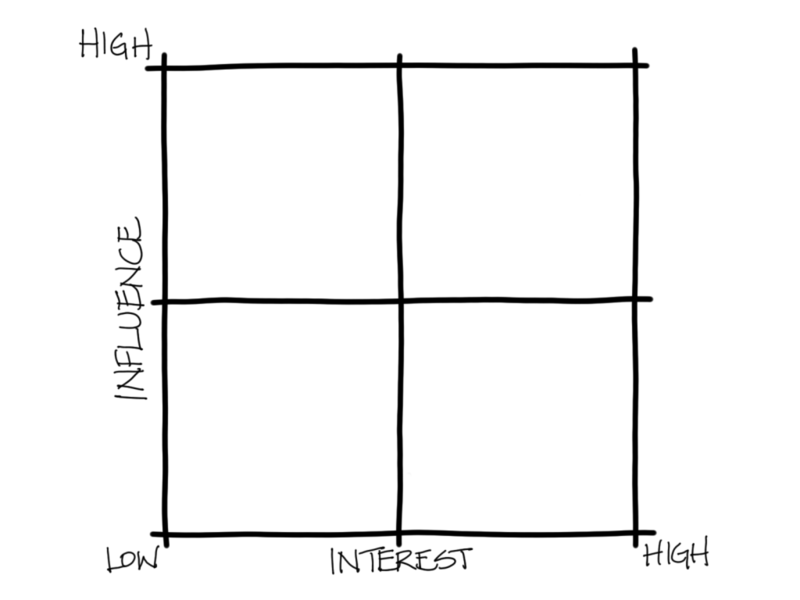 The Gamestorming article provides more detail on how to do stakeholder analysis in a highly collaborative manner, and the axes are switched between the two approaches. But both approaches provide a means of understanding your stakeholders to establish communication plans for them. If you learn better with video rather than reading, you may want to check out Analysis Techniques for Product Owners Live Lessons, a set of video training sessions that show you how to apply analysis techniques to product ownership. Lesson 2.1 focuses on the stakeholder map.